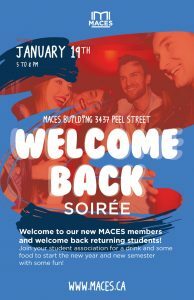 Welcome to our new MACES members and welcome back returning students! Join your student association for a drink and some food to start the new year and new semester with some fun! Where: MACES Building – 3437 Peel Street!